Verse AND Chorus! Tradition...pass it on. I learned it at PC Lujan Elementary school! 'Here we are on Guam, without a chance of snow! Where the trade-winds go, a typhoons sure to blow! 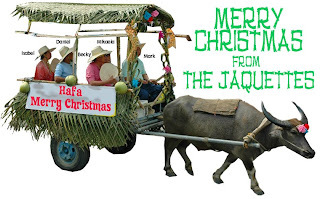 instead of driving 8 reindeers, he rides a carabao! Dad West as well (all we need is Mom Mary! ).